My son is finally old enough to eat purees! Yay! As a speech language pathologist and foodie, I have been counting down the days until we could start eating food. I received a baby food maker, the Baby Brezza, as a gift, and was thrilled to test it out. After much deliberation, I chose sweet potatoes as his first food. We did peas, green beans, carrots, and rice cereal. Then I wanted to try apples; I mean, applesauce is a food most babies love. I should tell you that this joyful adventure also comes with some anxiety for me. As you know, I have a whole bunch of food allergies, and I worry that our son will inherit them (or at least a few of them). I did not have allergies until I was in my 30’s so, it might not be an issue at all. Regardless, my husband and I are taking all needed precautions to watch for allergies as we introduce new foods. We are following the 3-4 day ‘wait rule’ which basically means…introduce 1 new food at a time, and nothing new for at least 3 or 4 days. Some people wait less and some people wait longer, but we chose this amount of time because Miles is slightly higher risk for allergies; and his doctor recommended it. We also decided that I won’t cook foods that I am more severely allergic to, just to prevent cross contamination and exposure in the house. Back to the apples! I bought 3 organic Gala apples, peeled them, cored them, and chopped them up into 1/4 inch pieces. Then all I had to do was add water to the water tank on my Baby Brezza, set up the food pitcher/blender (the blade must be in the elevated position) and then add the apples. Cover, set it to the appropriate cook and blend time (15 minutes steaming, auto blend), and go! It could not be simpler. The machine did the rest. When it was finished, I removed the pitcher with the pureed apples to let it cool on the cutting board. Once it was warm but not scolding hot anymore, I poured the blended apples into my silicone freezer tray (made by WeeSprout), snapped on the lid, and let it set for 12 hours. In the morning, I popped them out and placed them in freezer safe 2-6 ounce glass jars (I bought mine from Jervis & George and Glasslock). Label them with the food name and date, and leave in the freezer until the day before you’re going to use it. My baby food cookbooks all say to remove the food jar from the freezer and let it defrost IN THE FRIDGE for 12 hours. Then you heat and serve as usual. If I know that I am going to be using the food right away, I put a few servings in the fridge immediately (right after cooking the food, once it is cooled) and then the jar is ready to go when I need it. Once Miles is eating larger portions, I will skip the freezer tray and pour the 2-4 Tablespoons of food right into the jars. The little portions (1-1.5 oz) are great for now, but not as necessary once he is bigger. If you don’t have a baby food maker like mine, you can steam it on the stove top the old fashioned way and then blend it in a food processor or good quality blender. I just like that it does the thinking for me and clean up is simple. 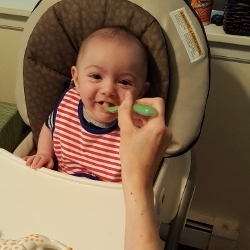 I included a picture of my little one enjoying his first few bites of apples. He LOVED it! You can see in the recipe photo that the apples are cooking in the Baby Brezza. Wash, peel, core, and chop your apples into 1/4 inch pieces. Add the apple to the baby food maker 'pitcher'. Make sure to add your water to the steamer. Program it for the right amount of time (see the booklet or a cookbook for specific food suggestions); the apples cook for 15 minutes in my machine. Let the apples cool. Pour or scoop the apple puree into a freezer tray for 1.5 ounce portions and freeze overnight (I use a snap on lid, but wrap with plastic wrap if you don't have a cover). Let them set for 12 hours. Then pop them out and store in baby food containers (I like the freezer safe glass jars). 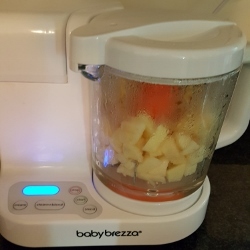 If you don't have a baby food maker, you can steam your apples the old fashioned way on the stove top and then blend them in a food processor or blender of choice. Regardless of how you cook your apple puree, be sure there are no lumps. Smooth puree is essential for Stage 1 baby foods. Always keep your hands and cooking surfaces clean when preparing baby's food.